One of our favorite artists is having her first solo show! Wanda is not only a divinely talented artist, she is also one of the friendliest and sweetest people you will ever meet. We love the story about how her solo show originated. Read on to find out! We’ve learned that some of your artwork will be featured in a local exhibit. Can you tell us a little bit about it? Sure! I’m very excited because this will be my FIRST SOLO SHOW for my art. I didn’t know my life would contain many more exciting “Firsts”. Sometimes I feel a little sad that there won’t be another first kiss; first time falling in LOVE; first time to travel to Europe; first time to become a mom; first time on a zip line… etc. etc. etc. This new FIRST is quite an unexpected JOY! 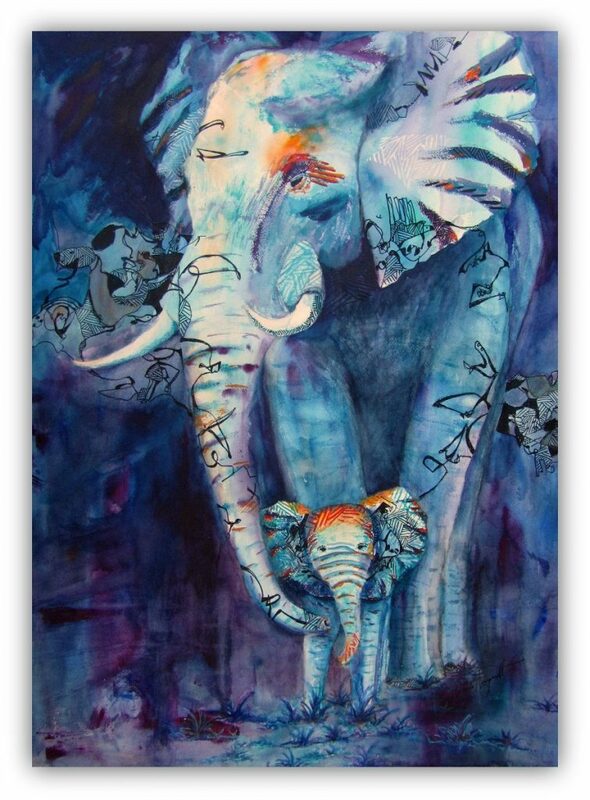 The show contains Watercolor, Acrylic and Mixed Media paintings. I have both framed pieces and also paintings on gallery wrapped canvas. The RECEPTION will be Wednesday, April 17th 2019 11:30 a.m. to 2 p.m. There will be at least 17 original paintings at the reception, ranging from a large 30” by 40” canvas to little 4” by 6” mini’s. At the reception, I will also have greeting cards and prints available. We’ll have cheeses, meats, crackers, fruit and drinks… so no one will need to leave hungry or thirsty! I will also be giving 10% off all the original art on the reception day. The show will run indefinitely with pieces being rotated periodically as paintings sell etc. Was there anything in particular that inspired you to become involved with this exhibit? I was invited to do the show by Desiree Ragadio, a business development representative for the Point Loma Credit Union. 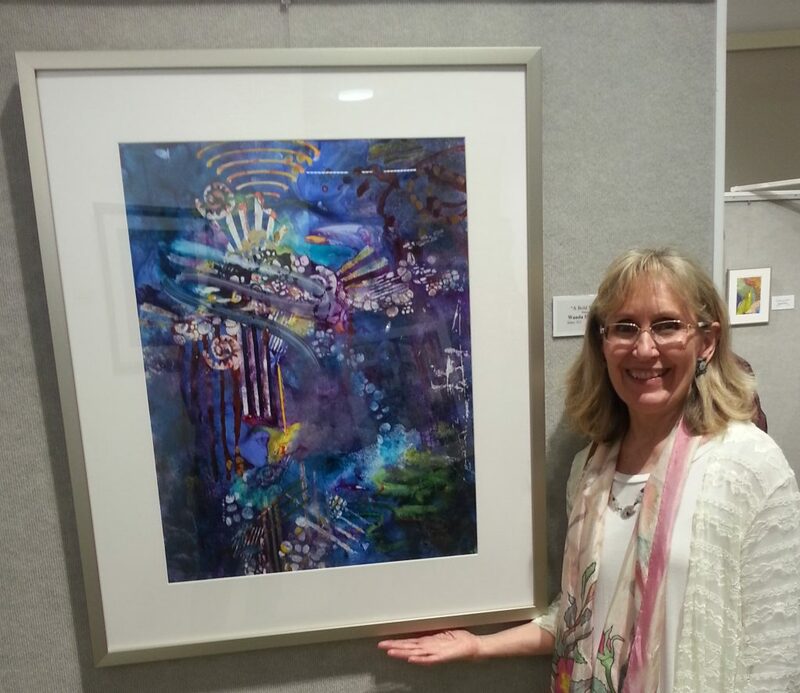 Desiree was attending a First Friday opening reception at the San Diego Watercolor Society (SDWS), I happened to have an Angel Painting in the show that month that had received an award. As has become custom at SDWS, the award winning artists speak about their paintings. I could not have received a comment that I found more rewarding than that… her comments also touched MY heart! Desiree asked if I would be interested in having a solo show at the Carlsbad branch of the Point Loma Credit Union. I agreed to talk to her about it… we later worked out the details and the show was born! … So I guess, in a way, it’s another First time giving birth for me… without the 12 hour labor! What else can you tell us about your painting style, how you got started, or why you paint? I paint for the pure JOY of it! People often ask me how I come up with my ideas. I’m a highly intuitive painter. Sometimes an image or an idea for a painting comes to me in a meditation… sometimes in the shower… sometimes chopping veggies for dinner… almost anytime, anywhere. Sometimes I start a painting with an idea in mind, but often I just start painting and see where my intuition leads me. I’ve had training in good design principles, so as I’m painting intuitively, these principles are guiding me as well… or if I totally miss the mark with design when I’m painting with abandon… I’ll go back later to fix what needs to be fixed to make a good painting. Most of my paintings have a strong narrative. I love to create paintings that tell a story. 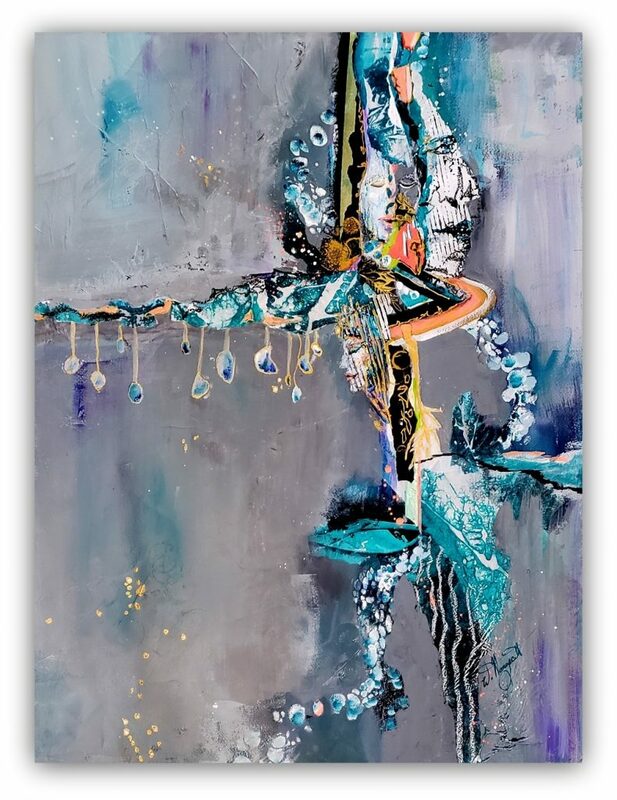 I think that part of me connects to the cosmos on a very deep level… perhaps channeling some profound spiritual message and part of me is just a little goofball who likes to giggle at creating my more fanciful paintings. In each of my paintings I include a tiny heart which represents LOVE and a tiny stick figure hawk which represents our connection to the divine. I love painting and I love LIFE! Can you tell us a little bit about your favorite aspects of the San Diego Watercolor Society? The members are, in a word…..Awesome! I’ve never seen so many intelligent, creative, talented, loving, capable people in one organization. I feel so blessed to be a part of it all. If people would like to view more of your artwork, what’s the best way for them to follow you? I almost always have a painting or two at the San Diego Watercolor Society. I also send out emails about once a month to people who are signed up to my art-news email list. The emails show a few of my most recent paintings and where they can be seen. If someone wants to be on that list, they can leave me a message through the website. NOW a SNEAK PEAK at 2 future happenings! When: The reception will be: Saturday, August 31, 2019 5 p.m. to 8 p.m. The show will run the month of September 2019. This will be a ticketed/ fund raising event. 100% of my profits from ticket sales will go to charities/ non-profits. The San Diego Watercolor Society will be among the organizations I will donate to. I’m already planning a huge painting on canvas (or maybe a triptych) of a visual image I had during a meditation at Trilogy. I’m sooooo excited about the possibilities! I’ve also been asked by SDWS to teach a weekend workshop in the spring of 2020. I LOVE to teach! It’s such a JOY to me! I’m honored to be asked to do it. 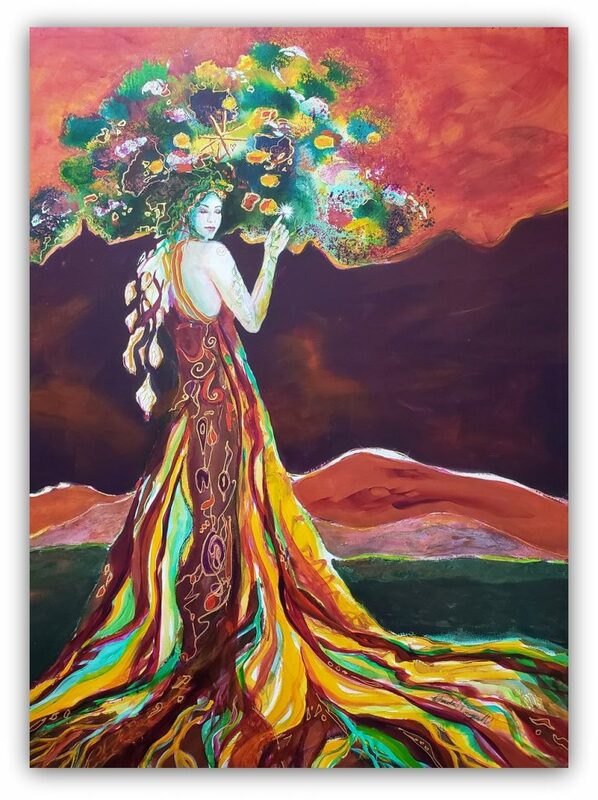 This entry was posted on Thursday, April 11th, 2019 at 11:29 pm	and is filed under First Friday, Member News. You can follow any responses to this entry through the RSS 2.0 feed. You can leave a response, or trackback from your own site. hi! I love Wanda’s work….so went to her website and realized there is a typo in this…it should be wandahoneycutt.com ….not .org. Thank you, Melanie!!! We’ve updated the link. Thank you so much for letting us know. Have a great day!